Click on the photo above to see a photo slideshow of the event. For more photos from this event, please visit our Facebook album. The sun shone bright on the National Mall as marchers from far and wide waited for the start of the 45th annual March for Life. This year’s march, the largest pro-life demonstration in the United States, had a notable first. It was the first time that a U.S. president spoke to marchers live via satellite from the White House. President Donald Trump thanked the marchers for their dedication to defending life and promised to do the same in his administration. 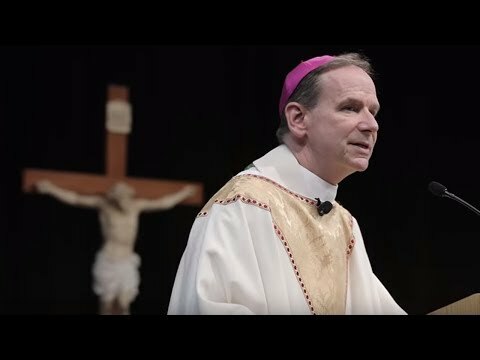 Bishop Michael F. Burbidge led a large contingent of pro-lifers from parishes and schools from throughout the Diocese of Arlington. House Speaker Paul Ryan, R-Wis., Reps. Dan Lipinksi, D-Ill., and Chris Smith, R-N.J., spoke to the marchers on the mall. Ryan credited the rise of the pro-life generation with the fact that truth, science and love are on their side. Rep. Jaime Herrera Beutler, R-Wash, told the moving story about her unborn baby who was diagnosed with Potter Syndrome, which prevents the fetus from developing kidneys. Beutler and her husband were told it was a fatal condition. Instead of giving up and turning to abortion, Beutler decided to fight for her baby. With the help of an experimental treatment, Beutler said Abigale became the first baby to survive having been born without kidneys. She later received a kidney donation from her father. Abigale, now 4 years old, joined her mother on stage to witness to the miracle of life. Reproduced with permission from the Arlington Catholic Herald. The EagleBank Arena in Fairfax was teeming with nearly 7,300 young people from across the country who believe Life is VERY Good. The January 18 rally, sponsored by the diocesan office of Youth, Campus and Young Adult Ministries, kicked off the annual March for Life events. Cheers rang out many times during the evening. The band HawkNelson opened the evening with high energy. Ennie Hickman, president of the missionary organization Adore Ministries, welcomed everyone. EagleBank Arena in Fairfax filled with more than 5,300 people for the morning Life is VERY Good rally and Mass January 19. The crowd was greeted by Father James R. Searby, chaplain at George Mason University in Fairfax. Ennie Hickman, president of the missionary organization Adore Ministries, gave the keynote address. Bishop Michael F. Burbidge welcomed the crowd and read a letter from the apostolic nuncio, Archbishop Christophe Pierre. During his homily, Bishop Burbidge shared examples of light dispelling the darkness. Between the evening and morning rallies, 11,109 unique participants attended from 50 dioceses and 26 states. The largest group attending the morning rally came from Saint John Paul the Great Catholic High School in Dumfries with 461. Diocesan middle and high school students totaled 1,635 participants. Between the two events, the state with the most attendees this year was Virginia with 2,978 participants from the Dioceses of Arlington and Richmond combined. More than 2,600 of those were from the Arlington Diocese. The state with the second-most attendees was Louisiana, with 1,195 for the evening rally from the Archdiocese of New Orleans, the Dioceses of Baton Rouge and Houma-Thibodaux.